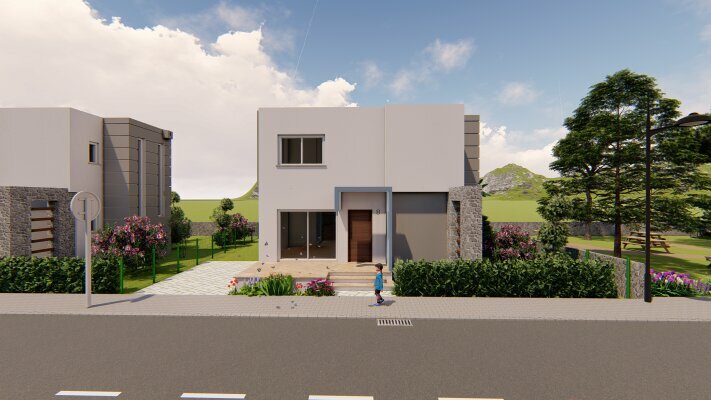 Located in the new complex in Dipkarpaz peninsula, these spacious two-bedroom villas will be your favorite vacation spot. This cozy complex with a swimming pool is only five hundred meters from the sea and beautiful sandy beach. Shops, restaurants and cafes are all at a walking distance. There is magnificent popular Long Beach and the entire rich infrastructure of Iskele just 20 minutes away. After half an hour drive you will find the incredible protected beach of Karpaz, fascinating with its length and beauty and known as one of the ten best beaches in the world. Each villa in the complex is two-bedroom with an area of ​​90 m2. On the first floor there is a living room and a kitchen with a terrace and access to a cozy garden, on the second floor there are two bedrooms and a bathroom. The villa is built using high quality materials. Flooring is tile and parquet, internal marble staircase is a composite railings made of glass and aluminum. There is a large swimming pool, a playground for children and a spacious seating area and barbecue where you can spend a great weekend. The villa can be purchased with a two year interest-free installment plan.